Being from Mexico, the topic of immigration can be a sensitive one. Millions of people have immigrated in the past decade and like every decision that one makes, people immigrate to find happiness. I would like for my opinion today to go beyond the normal political talking points. Instead, I want to share my experience of adjusting to American culture so that I can help anyone else in similar circumstances. Many people in Latin American countries and beyond have a strong desire to immigrate to the United States. There are infinite reasons why a person decides to immigrate – they may be political, cultural, educational, work-related, or, like me, to be with family. Like I shared in my post about long-distance relationships, I came to the United States 8 months after marrying my husband in Mexico, all of which were spent waiting for the government to approve my visa. Getting married to someone from another country didn’t only mean a change in my surroundings, it was also a change in the food I would eat, the culture, and the language. I didn’t know any English at that point, which made my ability to communicate with my extended family almost non-existent, or through hand signals. Of course my husband was always there to translate for me and everyone was so patient and kind to me. 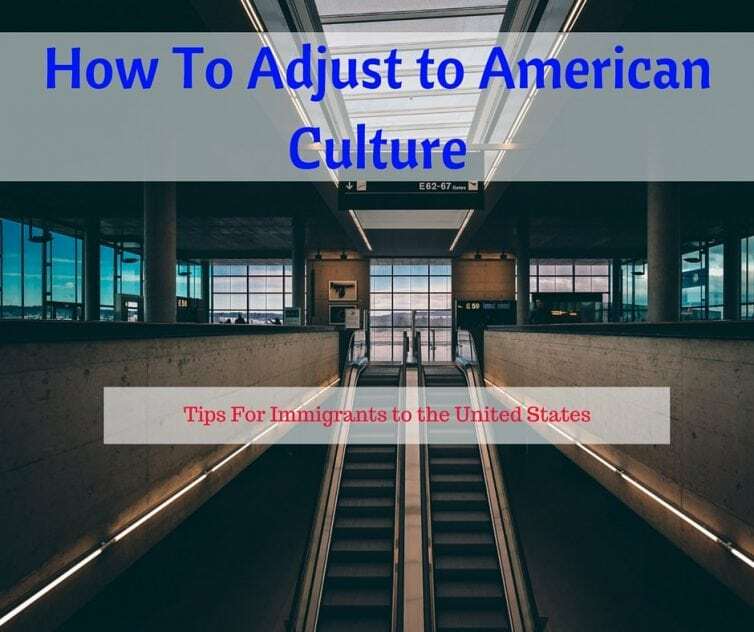 That said, those experiences caused me to feel insecure, depressed, and anxious – which made adjusting to American culture a somewhat difficult process. So how did I overcome this difficult stage and learn to adjust? It definitely wasn’t easy, but I found that the following tips helped me to improve my situation and even to enjoy it! This is one of the first issues that you will face when you leave your country. You will have to learn to be away from your family members, your friends, your lifestyle, and even the weather that you are used to. You have to learn how to leave many things behind. Even though it is difficult to let go, it is an important part of the process that will help you to achieve even greater things – in my case, to start my own family. The first six months for me were terrible, as I had to learn the hard way how to leave things behind. On an almost daily basis I found myself crying and saying that I wanted to go back to Mexico. That went on until I realized that this was part of starting over, and I would still be able to visit my family, even if it wasn’t going to be the same as before. I definitely recommend that you stay in contact with everyone that you love. These changes can be overwhelming – especially in the beginning when you have just moved and are learning how to adapt. Let me tell you – change is a good thing because it helps us to evolve and improve as people. There is always something to learn from good and bad situations. The important thing is to maintain your own identity. A change of in my surroundings didn’t only help me to embrace a new culture, it also provided me with the opportunity to give my children more socio-economic stability. It also gave me the opportunity to have a stable, loving marriage, which is what I always dreamed of having since I was a little girl. Change can be tough, but it is worth it. This starts by learning the language – this is a key step towards becoming integrated in society and not becoming an eternal immigrant. Even 7 years later I am still improving – it has been crucial in allowing me to find new friends and to show respect for the culture of the country where I now live. There are so many ways to learn – I never took formal classes, but just by watching the news, other TV show, and talking with people has helped me to be able to speak almost fluently. No make the mistake of isolating yourself. I know many people that have lived here for more than 10 years and they still haven’t been able to “adapt” to the culture and who don’t speak any English. I know that it is not easy to learn another language, but there are so many tools that can help, including free classes in many libraries and schools. The best way to look at it is that we should try to adapt to the new culture, and not wait for the new culture to adapt to us. Your values are must more precious and important than any title that you can achieve or obtain going to school or than your material possessions, because they (your values) are what will really set you apart from other people in your new home. You can be royalty in your own country, but once you leave its borders many will see you as just another immigrant. That is why it is important to work hard and take advantage of the opportunities that arise. It is very important to be gracious for the welcome that your new home is giving you. The change of culture and surroundings will be very drastic, but try not to be negative. Choosing not to judge will allow you to be an objective observer which will help you to develop a better, multicultural understanding. In the years since arriving, I have found out that many things that I thought I “knew” about this country were completely untrue, and I have tried to adopt all of the good things about it without losing my own identity. I have tried to leave behind bad habits that I brought from my home country, because being immigrants in another country means that we are representing our home. If a country brings you in, the least we can do is bring positive change with us. So, time to leave behind bad habits – what we all want is to improve anyway, right? Having a sense of humor can make all the difference! Being in new surroundings means learning new things and making mistakes in the process. For example, when I first arrived I noticed that a lot of people greet you saying, “How are you?” In Mexico, if someone says that to you, it has a lot of meaning and they are expecting a true answer. Here, people say it more informally and it is just like saying, “Hi,” it doesn’t mean that they actually want to know everything that is going on in your life. Many times I found myself talking to myself when people said it to me in passing, and other times people stared at me with confusion on their face because I was telling them all about my day! So – learn to laugh at yourself. Most people will admire your tenacity and efforts to adapt to their culture. Whatever your situation or your reason for leaving your country might be, it is important to be sure that it is the right decision, to have clear goals, and to learn as much about the the place that you are going as possible. The most important thing is to do it for the right reasons and to be sure that this decision will bring you the happiness that you are looking for. It will be a very difficult process, but it will change your life for good. When you look back you will see the growth that you have achieved as a person. Don’t get discouraged and I wish you luck in the coming adventures. I see that you definitely have to described the mental challenges of moving to another country. Many years ago the Army sent me to Germany, for a 3 year tour. What you described, when not able to get into the right mindset is so true. I met a number of soldiers and even spouses who shut themselves down to the idea of the new experience, and wouldn’t even leave the base, except to take a “vacation” back home. Vet Sad! One thing I would add, especially with cell phone/apps/Internet capabilities now (didn’t have them in the ’80’s), is buy your favorite type of newspaper or magazine, and for only 15-60 minutes a day, read it. Have your app or translation dictionary available and go back and forth so you can pick up on new vocabulary, but it is also extremely helpful with integrating you into the grammar of that culture. You also learn, culturally, what that new environment deems news worthy or current. Thank you for your comments! I love your tip about reading a magazine or newspaper – there are so many resources available now to help learn a new language and I really think that not learning the language is what holds a lot of people back from adjusting to a new environment and culture. We came from war torn Holland in 1960 to New Zealand, the land of sunshine and good food and only 3 million inhabitants! The then Prime Minister knew the names of everyone that did not have a job and it were two jobbos too lazy to work! We got a real culture shock, so english and the people were so colourless in this gorgeous sunshine filled country! We dutch come from a country that is cold, grey and rains and storms a lot, so our clothes tend to be colourful to cheer us up! Our homes are heated so floors are laid over concrete, usually wooden and pale, and furniture very swedish and minimal! So to come to this country that seemed 30 years behind, and not speaking the language was a huge undertaking for my poor mother that never fitted in a mold! We kids just went to school and fought our way round the school grounds to get the upper hand and the first thing I learned in English is swearing, and that in a strict roman catholic school hahaha! Our food was so different as well and it threw my mother, we adjusted and taught our mother to cook (she was an atrocious cook anyway, could burn water, hahaha) and when I met my welsh husband got married and had three children! Can remember my mother in law (Welsh) looking in the colourful pram and at my baby and with a prim and lemon mouth proclaimed her babies wore white until they were 5 ( A huge lie) and here was my baby in bright red and black trimmed outfit! I made most of it as you could not buy it here but my aunt sent me a Burda and I made clothes from that and I am still eternally grateful to her! I always got asked did your Mum sent you these clothes? She finally told me it was her fault they never came, she come to the conclusion I was different, not WRONG! Must admit to shedding a tear in private as we could’ve been so close and I was an immigrant child so had no family apart from my Mum and Dad and my brother! Brother and I taught Mum and Dad a lot about New Zealand culture and they found the Maori closest! Lot of young dutch males married Maori maidens and lived happy lives! Now when I go back to see my family once every 10 years I wonder how on earth I ever lived there! Miss the wide open spaces, the green, the mountains and most of all the quiet people, the dutch are soo noisy hahahaha! See, you do adjust but as I said to my husband you can take the girl out of Holland but never the Holland out of the girl! What a story! Thank you for sharing with me. Adjusting can definitely be difficult, but it is so important. I also think its important to cherish and remember your roots, even after you have adjusted. Thank so much again or your comment! This post is awesome and I’m so glad I found it on Pinterest. Like TINEKE I am from New Zealand – although I have lived here my whole life. In a few years after marriage and I’m done with studying we are looking at moving over seas… Maybe to the USA or somewhere in Asia. I am an ESL teacher and it’s so, so important to meet people and practise speaking the local language. I’ve tried to learn languages online and alone at home and it’s so hard. Definitely speaking with the locals helps. Your post made me grin – even as a native speaker I feel like I make mistakes too and get blank looks from people who don’t understand me sometimes! Thanks for the great post. I look forward to reading more. Thanks so much for sharing this post, Charbel 🙂 We are in the process of getting visas for my husband and two stepsons (moving from Peru to the US) so this is invaluable information for them. I was so pleased to see that you have it available in Spanish too! Thanks for writing this. I am a native born American who has never lived abroad (just traveled, which is very different), and I stumbled upon this post while searching around for how I can be the best support to my brother & sister in law who just immigrated to the US about 6 months ago from Belarus. There are very few resources out there that I’ve been able to find that talk about how to help someone just as a friend – but reading your perspective here was super helpful. I’m very touched by what you said about being humble and grateful for the welcome this country is giving. I’m not sure I’d be strong enough to feel that way if I moved to a new country and this is very admirable, and probably hard at times. Thanks again for this thoughtful and honest post. Now I’ll also check out some of your recipes!